How do you paint water? How do you know that what you are painting is water? 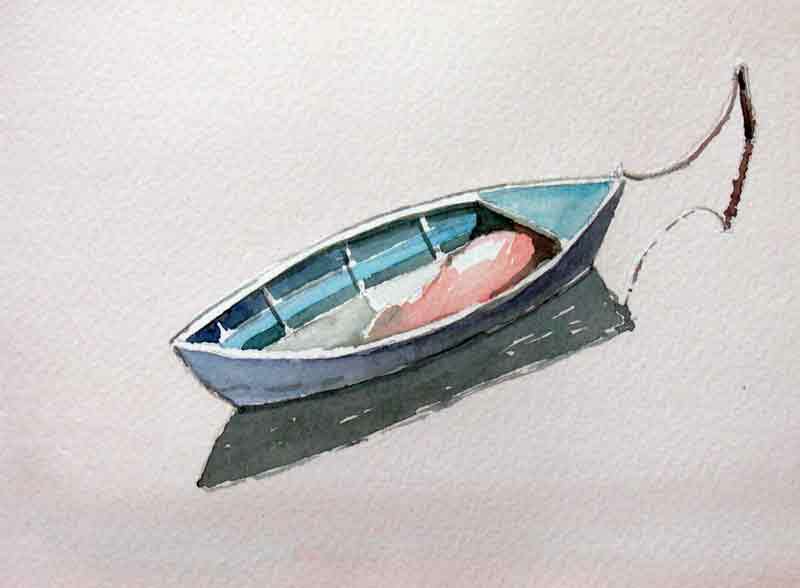 Using three primaries again, I did a quick sketch of a tethered dinghy on calm water. How do you know there is water? Well, the reflection is one dead giveaway. But the second clue is the boat itself - what do you think when you see a boat? Unless indicated otherwise, chances are that you mind will be looking for the boat's support - the water that it is usually sitting in. Whether it is a lake or a river, or even the sea. And when you find a reflection beneath the boat, your mind will confirm what you are seeing is a boat on water that you are seeing. So in sketching, the trick is to keep your pieces simple, with just enough information to let the viewer fill in the rest.